Look out she is going to sneeze!!! The Kamijous and Misakas are having lunch. Touya is surprised that Misuzu is Mikoto’s mother and that she is attending university. Touya asks Touma about it being weird. Before Touma can answer, Index answers and explains it is weird that there are so much young people around Touma. Misuzu then announces to begin lunch and presents Mikoto with an enormous meal. Misuzu tells her daughter that she needs to eat up as the nutrients are not getting to certain parts of the body (i.e. Mikoto’s breasts). This makes Mikoto blush and angry, Misuzu stretches and shows (hers) off. This turns Touya’s head and he blushes which results in him getting an evil stare from Shiina. Touma repeats Misuzu’s statement, whilst looking at Index. Index catches Touma looking at her and she gets angry. She is about to bite him, when she remembers what happened before. She then just sits down, which makes Touma nervous as she didn’t attempt to bite him. She needs a driving license for that!!! Meanwhile, Oriana is walking about and helps out a little boy with his balloon stuck a tree. She is in communication with Lidvia Lorenzetti; who shows concern over not limiting Oriana’s contact with civilians. Oriana tells her she trying her best and asks Lidvia how are things on her end. Lidvia tells her that she has been keeping a low profile in a hotel lobby. Oriana shows jealousy as Lidvia has such a cosy safe harbour. Elsewhere, Index asks Touma that she wants to buy a drink from a vendor. Touma asks her why after having lunch earlier on, adding that she would get fat. Index tells him that she won’t and to prove it by measuring her stomach. He tells her that he doesn’t carry a tape measure; Index replies that he doesn’t need one. In another place, Mikoto is running when she is called from behind. She turns around to see Kuroko racing towards her in a wheelchair. Mikoto dodges her and Kuroko crashes into some bushes. Kuroko complains that she shouldn’t dodge her. Mikoto apologises and tells her that she is in a hurry. 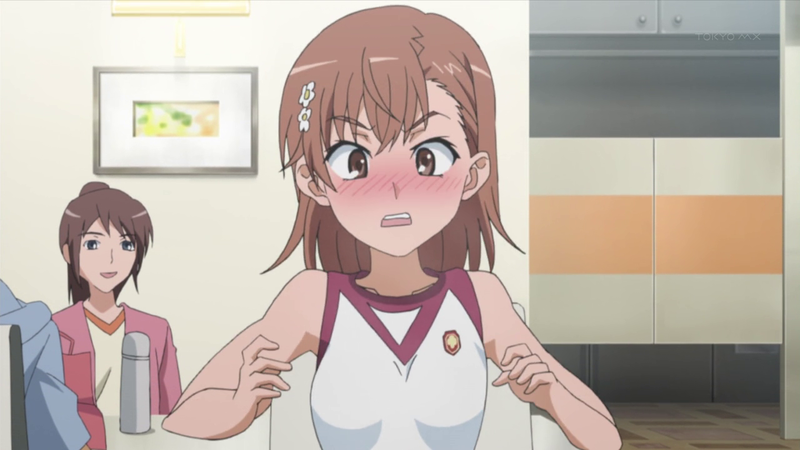 Kuroko suspects Mikoto of meeting Touma. Mikoto denies it for Kuroko to point out that Touma is nearby. Mikoto looks up to see Touma hugging Index’s chest. Kuroko suspects that he is listening to Index’s stomach and suspect that she is pregnant. This angers Mikoto and she runs up and punches Touma in the face. 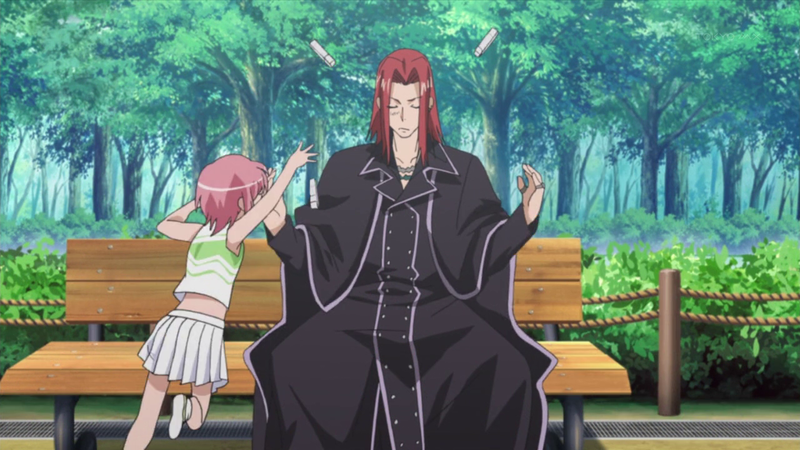 Touma goes flying and sits up to find that he had taken Index’s skirt with him. He looks over to find Index cowering behind Mikoto and Kuroko; who are ready to strike. This makes him run off stating his misfortune as they attack. Neat trick; can you make her disappear? In the park, Stiyl is on the phone to Sherry Cromwell; who is complaining about Orsola. Orsola, now a member of Necessarius, is accompanied by Sherry and is scattering crumbs of Amakusa-made cupcake she is eating. This prevents Stiyl’s conversation from being serious, and Stiyl has to hang up. He lights a cigarette, but only to be stop by Komoe. Komoe tells him that smoking is banned in Academy City all day. He tells her he knows before lighting another cigarette. Komoe kicks up a fuss which gathers a crowd which includes Aisa, who spots Komoe. 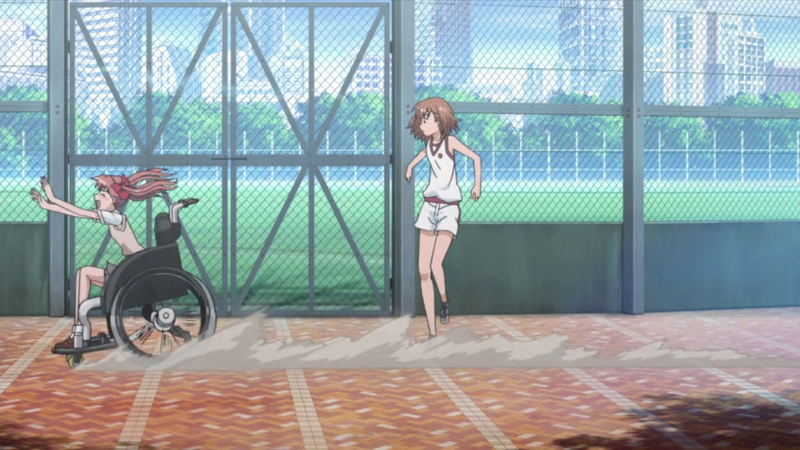 Touma, who is running from Mikoto’s attack, manages to escape. He is then is spotted by Aisa, who asks him to come with her as there is a problem. She takes him by the hand and leads him into the park. He then asks her not to hold his hand, in which she lets go, blushing. Aisa leads Touma to see Komoe trying to confiscate cigarettes off Stiyl, who preventing her by juggling them. 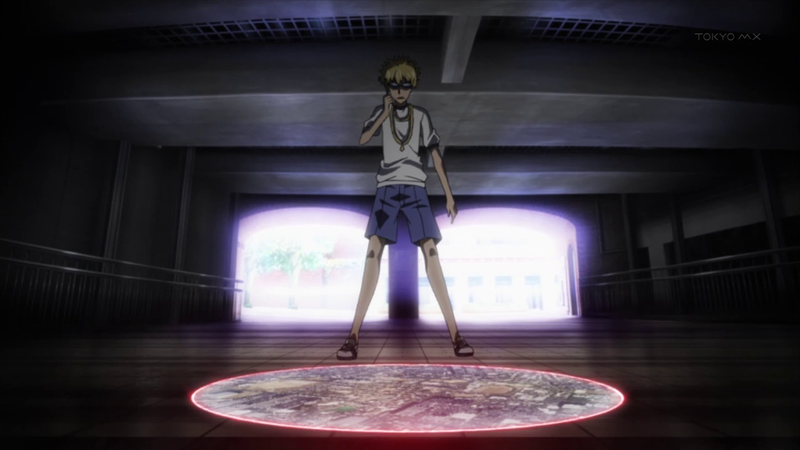 Touma then gets a call from Motoharu, telling him that he has located Oriana and to bring Stiyl to intercept her. Touma and Stiyl run off; Touma asks Aisa to sort out the confrontation, in which Aisa restrains Komoe from pursuing them. If that is sick, I am not cleaning it up!!! Stiyl and Touma catch a train to meet Motoharu, however arriving at the station he is nowhere to be found. Touma contacts him to find that he is stuck in a traffic jam. He asks Stiyl to search for Oriana using magic, but it is out of his expertise so Motoharu decides to do it himself. Oriana feels the presences that they are searching for her and she wonders on how to make her move. Meanwhile, Komoe is having a drink with Aisa. She then notices Aisa in deep thought. Aisa tells her of her concern over Touma. Komoe shows her a pamphlet about a night parade and suggests that Aisa should go to the night parade with Touma. She dismisses the idea. Touma and Stiyl are running to locate Oriana; guided by Motoharu. Suddenly, they are cut off from Motoharu, they then realise that Oriana has gone after Motoharu, but cannot help him as they do not know his location. Motoharu fights Oriana but ends up losing. Oriana deals a death blow but Motoharu survives and tells her that he had a communication device that alerted the Necessarius and they are sending reinforcements. He then puts up a smokescreen and disappears. Oriana leaves, but Motoharu is still there, stating that everything he said was a bluff. Oriana runs away and stops thinking that no one is chasing her. She then decides on her next course of action, when she is bumped into by Komoe, who then rebounds into Aisa spilling her drink over Aisa’s top. Oriana watches as Komoe apologises to Aisa, when she spots a cross around Aisa’s neck; revealed by her wet top. Oriana invokes a magic spell, which makes Aisa experience pain before she explodes in a shower of blood. Stiyl and Touma close on Oriana, only to find a crowd of people. 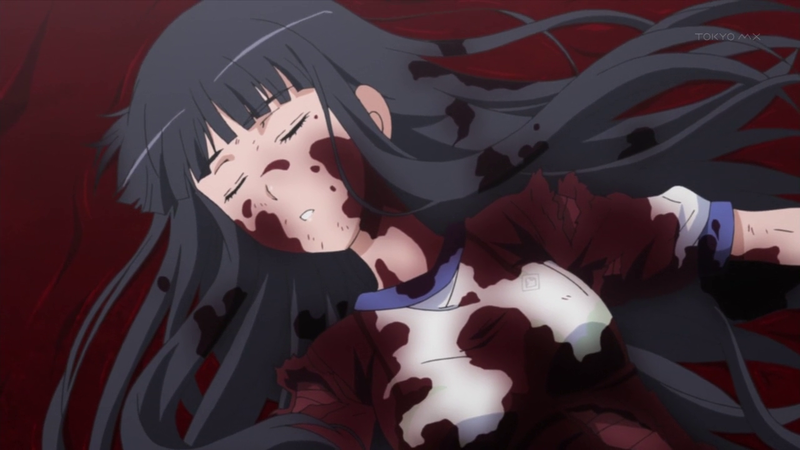 They go over to find Komoe crying over Aisa in a pool of her blood. They realise that Oriana was behind this and mistakenly attacked Aisa because of the Walking Church necklace; associating it with Necessarius. Touma suggests that they must do something to help Aisa. However Stiyl asks him what can they do help Aisa. He tells Touma that only the both of them can chase after Oriana. Suddenly, Stiyl notices Komoe setting out a healing spell, stating that it worked for Index. Stiyl realises it was her who performed a healing spell with Index. He then stays with Komoe to perform the spell and tells Touma to chase after Oriana. Touma promises Aisa that he would go with her to the Night Parade and then leaves to chase after Oriana.